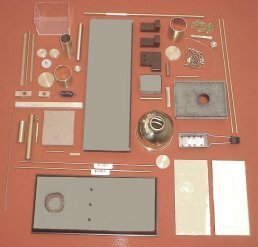 This kit is for a working model of the famous Newcomen atmospheric steam engine which was the first engine to be used commercially to pump water from mines. The probable first installation was at Dudley, England in 1712. It was designed and built in the days when boilers could only withstand 15 psi and pistons and cylinders could not be made to any great accuracy. The engines power came from the weight of the pump rods raising the piston to the top of its stroke, the cylinder being filled with steam and then water sprayed into the cylinder to condense the steam to cause a vacuum. The pressure of the atmosphere then forced the piston down giving the engine its power stroke. Hence the term 'Atmospheric Engine'. In 1763, James Watt's work on a model Newcomen Engine led to his development of a separate condenser and other improvements which revolutionised steam engine design. At first, the engines were manually operated by cords but soon the valve gear was automated. 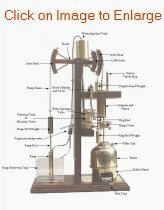 This model incorporates the main features of the original automated engines.It has a Plug Rod that operates the Steam and Water Injection Valves, a Buoy which controls the power strokes of the piston and a combined Snifting Valve and Eduction Tank. Newcomen Model with Motorisation Unit fitted. Click here to see a video of a Newcomen Engine operating with Live Steam. Click here to see a Moving Animation and Operational Description. The model is not difficult to build (no machining is required) but you need patience to set up and operate the engine - you will need an oily rag and a supply of tea towels until you get the hang of it! Disastrous consequences used to occur with the original Newcomen Engine when operated by an unskilled operator. 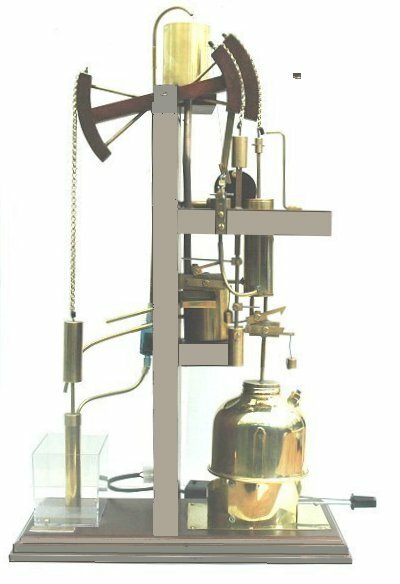 It is not an accurate scale model of the original engine but serves to demonstrate the main features of an early Newcomen automatic engine with a water pump. The boiler is heated by solid fuel tablets. All in all, an attractive model of interest to the connoisseur. The finished model stands 17" high x 11" long and 5" deep. Cylinder bore is 1" and maximum stroke is about 2" (variable). The kit come complete with a full instruction manual. allows you observe and demonstrate the engine working without having to fire up the Boiler. Copyright © Sussex Steam Co. 2013 all rights reserved.